The Theory of Escalation is a theory in criminology proposed by Christopher Nolan in The Dark Knight Saga. It has been discussed by comic book scholars such as Chris Sims and David Uzumeri in their analysis of the Batman films, and is the driving force behind persons who believe that Batman actually has a debilitating effect on Gotham City. 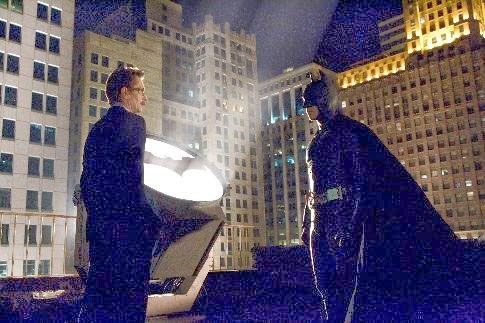 It was first introduced at the end of Batman Begins when then-Lieutenant Gordon (played by Gary Oldman) informs Batman (played by Christian Bale) of his concerns that Batman's activities will lead to escalation. As Gordon says, "[The police] start carrying semi-automatics, [the criminals] buy automatics. [The police] start wearing Kevlar, [the criminals] buy armor piercing rounds. [...] And, [Batman is] wearing a mask. Jumping off rooftops." Gordon then goes on to tell Batman about the Joker who has just showed up, seemingly in response to Batman. It gets worse in The Dark Knight. The Joker says that Batman has "changed things." Maybe. The Joker does show up out of nowhere, seemingly as a direct response to Batman's systematic destruction of Gotham City's organized crime scene. No origin story, nothing. But this all fails to answer the central question: Does the Theory of Escalation hold water? Comics scholar Chris Sims of Comics Alliance has written more than his fair share of text on Batman. In fact, he holds the title of Senior Batmanologist at Comics Alliance. In his and David Uzumeri's in-depth analysis of the Batman films prior to The Dark Knight Rises, he and Uzumeri observed in Batman Begins that Jonathan Crane was operating as the Scarecrow long before Batman showed up, seemingly debunking the theory of escalation right off the bat (no pun intended). However, they also observed that Batman's presence, while driving "old crime" (i.e., conventional criminal activities) into the ground, paved the way for supervillains to arise, committing "crime for the sake of crime." However, the only apparent evidence for this is to be found in the Joker's presence in The Dark Knight. In the eight years in between The Dark Knight and The Dark Knight Rises, the only criminals who pop up are Catwoman and Bane, neither of whom appear to have responded directly to Batman. True, Bane wanted to further Ra's al Ghul's plans from Batman Begins to destroy Gotham City, a plot which was foiled by Batman. But Catwoman couldn't possibly have responded directly to Batman, because he was apparently (though The Joker Blogs disagrees) inactive during that entire eight year gap. The Theory of Escalation depends entirely on the notion that if "old crime" were to somehow be completely driven out, a new type of crime would arise to replace it. In comic book Gotham City's case, traditional criminal enterprises such as the Falcone and Maroni crime families die off and are replaced by "freaks." There's still a small vestige of traditional organized crime, but it's usually either so marginal as to be almost irrelevant, or else have been co-opted by "freaks" such as Two-Face, Black Mask, and the Penguin, prominent crime lords in the comic book version of Gotham City. In the comics, the Falcones and Maronis were systematically killed off by supervillains, rather than being shut down by the efforts of Batman, Gordon, and then-District Attorney Harvey Dent (Dent later became Two-Face, killing Carmine "the Roman" Falcone). As depicted in Batman: The Long Halloween and Batman: Dark Victory, the mob is struggling from Batman's pressure, but slowly crumbles away to nothing thanks to the actions of Holiday and the Hangman, both of whom were revealed to have been Falcone family members themselves. Gotham City's organized crime is ultimately destroyed completely by a united force of Gotham City supervillains led by Two-Face. But none of this answers our question: Would the Theory of Escalation hold water in real life? Criminologist Dr. Jay Albanese of Virginia Commonwealth University seems to think so. In a personal communication, Dr. Albanese stated, "...[T]his [is] true, largely because the[ir] are always people who are looking to profit illegally, and their actions correspond with the changing threat of apprehension." He cited a longer explanation from a book of his (Transnational Crime and the 21st Century (Oxford University Press, 2011). ), where he states that criminals habitually adapt their methods and crimes to changing law enforcement tactics and technology. As Albanese writes, "Once thieves experience some success, the government and private industry take steps to reduce the opportunities for theft. This improvement in the detection and/or prevention technology is subsequently matched, and often surpassed, by criminals if they are to avoid apprehension." Sound familiar? However, in my quest to contact various authorities on criminology about this subject, only Albanese and one other responded, the the other stated that he did not know of any research being conducted in that subject. I have also neglected to attempt to contact law enforcement personnel about the subject. However, once I do, and if I receive a reply, I intend to write an addendum to this article concerning their opinion. In sum, the Theory of Escalation may indeed have some merit, though perhaps not to the extreme as posited in Christopher Nolan's The Dark Knight Saga, mainly because actions such as those taken by Batman have never before happened in the real world. While the idea of escalation is an interesting theory, from what I understand, there simply hasn't been any in-depth studies done on the subject. If there are any police officers, criminologists, or other experts on this sort of topic in the audience, I would like to hear from you in the comments section. As it is, Batman's exploits remain confined to the realm of fiction, and thankfully, his villains with him. There may indeed by real life superheroes, but there are no true real life supervillains, those that do exist being little more than internet trolls with cameras and lots of time on their hands (looking at you, Rex Velvet). It would be sort of cool if the Theory of Escalation did in fact hold water, but it would also be a very scary prospect. Because crime for the sake of crime reads a lot like chaos and anarchy.